With the help of this heart rate zone calculator, you will rediscover your regular training. In just a few simple steps, you will be able to see what your power zones are and learn to optimize your exercise for the best effects. Looking for how many calories you will burn while cycling? Check out the calories burned biking calculator! Before you will be able to calculate your heart rate zones (HR zones), you need to determine your Lactate Threshold Heart Rate (LTHR). It is the heart rate at which increased blood acidification occurs in your body. You can only cross this threshold for short intervals; prolonged training above LHTR makes your endurance decrease rapidly. To determine your LHTR, you need to do a trial run. The trial run lasts for 30 minutes, during which you should ride as fast as you can. Don't hold back - expect sweat, heavy breathing, dripping from the nose. Don't make any breaks, simply pedal for 30 minutes straight. Don't take the test in areas where you're forced to go uphill or downhill, and choose surroundings that won't slow you down (urban areas with traffic lights are out of the question). Do the test all by yourself - if you go with a training partner, the outcome will probably be different. Once the test is done, measure the average heart rate from the last 20 minutes of the test. This value is your LHTR. 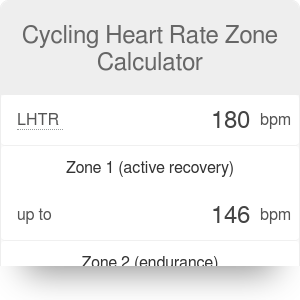 If you don't want to use LHTR in the calculation of your HR zones, you can check out the generalized target heart rate calculator. Once you know your LHTR, calculating the power zones is pretty straightforward. Our cycling heart rate zone calculator uses the values suggested in "The Cyclist's Training Bible" by Joe Friel, the world's most trusted cycling coach. Now that you know your heart rate zones, it's time to plan your training! In order to do that, you need to get a better understanding of what the power zones actually mean. Zone 1: active recovery. Also called "easy spinning," this form of exercise requires virtually no leg effort. It is typically used for casual cycling and recovery after races. Zone 2: endurance. It's a pace you can keep for the whole day, during long-distance trips. Fatigue level is low, but recovery from a long training session might take more than one day. Zone 3: tempo. Typically used in interval training, it requires concentration to prevent from falling back to zone 2. Zone 4: lactate threshold. A continuous sensation of fatigue and leg effort, requires high concentration. Exercising in this zone typically leads to a high frequency of breathing. Should be practiced in 10-30 minute intervals. Zone 5a: above threshold. Exercising in the zone slightly above the threshold also requires constant effort. It shouldn't be done for extended periods of time (over 30 minutes). Zone 5b: aerobic capacity. This is the typical intensity of intervals lasting for three to eight minutes. Training in this zone helps increase VO₂max (the maximum oxygen consumption). Zone 5c: anaerobic capacity. Training should only occur in short (30 seconds to 3 minutes), high-intensity intervals. You will experience a severe sensation of leg effort. When exercising in this zone, you shouldn't use the heart rate as your intensity indicator. Cycling Heart Rate Zone Calculator can be embedded on your website to enrich the content you wrote and make it easier for your visitors to understand your message.